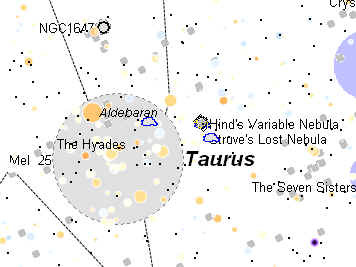 Hinds Variable Nebula is a fascinating object in Taurus near the Hyades and the bright star, Aldebaran, The star chart below shows its location. The bright orange star about 40" away from the golden yellow nebulosity is the variable star T Tauri (94-tau-Tauri), a well-known KOIIIe variable star ranging in magnitude from 8.5 to 13.5. 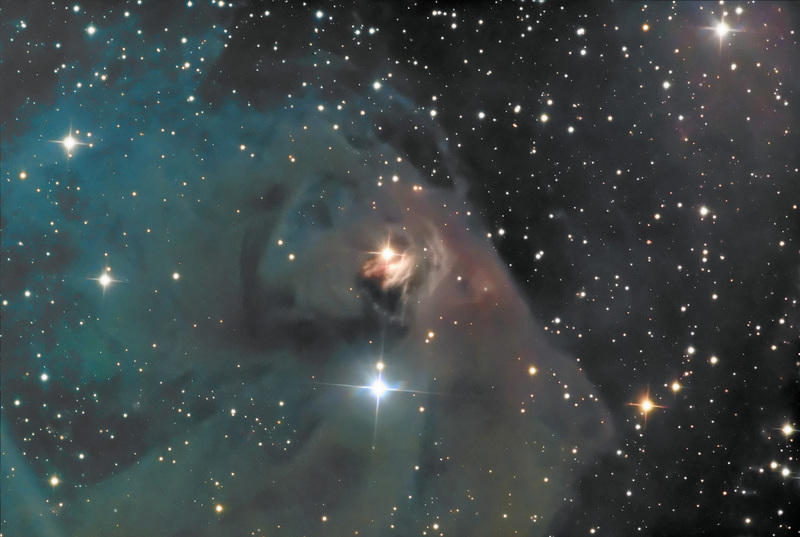 The nebula changes size, brightness and shape, but not in concert with brightness variations in T Tauri. This image is one of the deepest of the region that I could find showing extensive nebulosity well away from T Tauri, and the brighter reflection of Hinds Variable Nebula. North is toward the upper right corner. This image was compiled from data taken over several nights (Oct 18 – Nov 3, 2007). On the first night of October 18, 2007 starting at 10:39 PST, the first five sequential 30 min luminance frames caught an asteroid traversing the field. An animated GIF below shows the object moving close to T-Taru. I wish to thank my MPO partner, Paul Mortfield, for inspiring me to data mine these frames and show me how to use the Harvard Minor Planet Checker – a first for me. The MPChecker shows this object to be designated (32589) 2001 QR 127 with a magnitude of 16.9.